Check out how we painted the Grot Scuttlings. After having completed all the horrors we moved onto painting these weird goblin like creatures. It’s a bit like they took all the goblin models from the old game and squished them together to make these monstrosities. Since the models are almost entirely dark colours we used Vallejo black primer instead of our usual favourite grey primer. The skin areas were then base coated with goblin green and then highlighted with a roughly 1:1 mix of Goblin green and Dead flesh. The final highlight of Dead flesh was aimed mainly on their faces. I’ve painted goblins with this classic combination of greens since the 90’s. Regardless of whether it’s dry brushing, layering or airbrushing I love these colours. Oh and don’t forget to paint their ears! This time I made very dark green by mixing 3:1 – Black:Sap green. Apply this to all of the skin areas and once dry clean up with a make up applicator. To get some neat little shadows on the ankle bones only wipe from top to bottom. Take care on the fingers and toes to leave some wash in the recesses and remember it can always be reapplied if needed. In some places the make up applicator was too big to fit so on some arms and legs the outside has been cleaned of wash whilst the inside hasn’t been touched. I think this gives the models a kind of moody feel. Emma painted the cloaks with Eshin grey and then applied multiple thin layers of Nuln oil until they were suitably dark. I think this has given a nice smooth dark grey which works well here. Using the point of a high quality brush the webs and stitching were picked out with Celestra grey. Take your time and go carefully, a couple of coats here will do the trick. The brown weapon handles are simply Mournfang brown followed by a coat of Nuln oil. The strapping on the spears is a bit of an odd one since it was never repainted after the airbrushing. It was incidentally painted with the flesh tones, particularly the brighter ones. Emma simply brushed on some Nuln oil. I drybrushed Mournfang brown straight over the black and then gave them a second drybrush of Baneblade brown. This is a great way to quickly paint small wooden parts like this. For the feathers on the arrows layer on a few thin coats of Evil sunz scarlet. Since it’s quite a translucent colour anyway when painted over black it can be used to highlight itself. Great to get these little bits done fast. All the weapon blades and other silver parts were painted with our usual colours. That is base coat with Leadbelcher, shade with Nuln oil and edge highlight with Runefang steel. Base coat with Rhinox hide and layer with Ushabti bone. The teeth can be a little tricky, I suggest wiping most the paint off the brush and using a very light touch. Try to paint one tooth at a time. They don’t need to be perfect and can be touched up with Rhinox hide if needed. The grotty little mutated arms follow the rest of the skin but then received a final coat of Bieltan green. Another quick and easy step to add more interest. We paint a lot of glowing eyes by dotting them with White scar and then covering them with Bloodletter red glaze. We wanted to experiment further with this technique so also painted all off the little spiders like this too. After 6 or 7 coats of glaze we’re not sold on the results. Don’t forget these weird little dudes have 2 eyes per eye for a total of 4 eyes each. Let’s hope none of them need spectacles soon. Well we’ve never painted goblins like these before, they were great fun. I’m really pleased how well this choice of greens translates to the airbrush and oil wash method. The nets were a bit tricky to pick out and we both had a go at painting them at various stages, a true collaboration. If you’d like to know more about the techniques we’ve used on all the models and how we made the bases please check out the Techniques – How to Paint Warhammer Quest article here. Thanks for reading and we hope you enjoy these articles. You can let us know what you think in the comments below and follow us on Facebook. 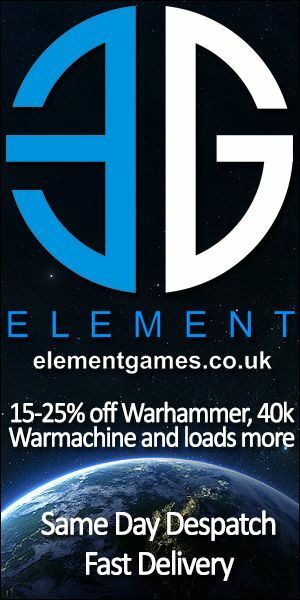 We also earn a little towards our paint if you shop with Element Games through us so please check out their selection of Warhammer Quest: Silver Tower heroes or if you haven’t already pick up your copy of the game. Use code VIN016 at checkout to earn double crystals on any order. Vince Coleman is a participant in the Amazon EU Associates Programme, an affiliate advertising programme designed to provide a means for sites to earn advertising fees by advertising and linking to Amazon.co.uk. adverts are helping us fund this site.